Feelings: Living in NYC can be a nuisance. There are so many people who do not respect other boundaries or different perspectives in life. Typically, the people who move to NYC are Type A, highly ambitious, status conscious and deadline driven, and it is extremely difficult to maintain my inner peace sometimes while trying to figure out which subway lines are actually running on a Saturday afternoon. But one of the greatest things about NYC is that I can say something like this: I am going to eat Uzbek food tonight in Rego Park. I don't know much about Central Asian cuisine. The closest I have gotten to is a Korean-Uzbek restaurant, Elza in Brighton Beach. But since I heard about Cheburechnaya, a popular Kosher restaurant for Russian expats, kids, and Shabbat dinner as well as offal loving foodies and hipsters, I had to bring my Ramen and Friends crew out to Rego Park, Queens. It is a very spacious spot that is perfect for group dining. There isn't much of a decor, but expect a TV monitor playing random music videos (tonight was Sade's greatest hits) as many Russian restaurants do. There is a bit of language barrier, but they are quite fluent when it comes to credit card transactions, as JBH noticed. The main attraction of the meal was what else...lamb testicle shish kebab ($5). Somehow it seemed the most appropriate way to eat testicles - Skewered by a miniature sword. There were also lamb hearts ($3.50) and deep fried beef brains ($9, interestingly served with a side of fries). Many of our adventurous food loving friends enjoyed these various meats while I enjoyed some vegetarian options such as samcy with potato ($11), samcy with pumkin ($10) and some fresh salads. Samcy is a baked pastry often stuffed with vegetables or meat. The dough was crispy and flakey, and MGru thought the pumpking samcy was nicely sweet. The potato samcy was even more flavorful, and the smooth texture of potatoes complimented the crunchy outer layers. 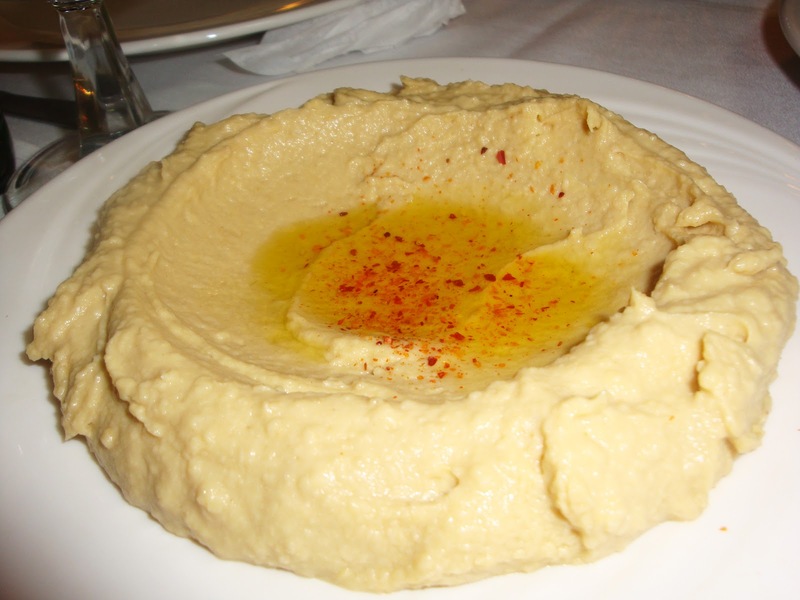 The baba ghanoush and hummus here were also excellent, and I might trek to Rego Park just for their fluffy warm bread and a creamy plate of baba ghanoush. The giant matzo bread was also crispy and tasty as well as a good centerpiece for the table. JBH also enjoyed samcy with lamb chops and chicken, and MGru found their whole chicken to be very moist and "chicken-y." Overall, as ALev said, "Although I didn't have the balls, everything else was great! Greasy, kosher, delicious!" As much as we appreciate the flavoring of Uzbek cuisine, it was a bit too heavy for some of us, especially when we didn't drink alcohol. "I'm always open to trying new foods from different cultures, but maybe Uzbeki food is the limit. Yesterday, my stomach was sore as if it had been repeatedly punched from the inside. The food was so heavy, fried and starchy that my stomach was exhausted all day trying to digest it," said BLee. It seems she is ready to move on from this new adventure of Uzbek cuisine. "...It tastes like affliction." That's the thing about NYC. "Trying out different former Soviet cuisine" can become a part of our daily lives. And as MGru said, "I would go back if I was ever craving heavy Central Asian food again." Yes, we know exactly where to go if we ever want to drink, eat heavy food to coat that vodka from your stomach and have a great time with a group of wonderful friends. The food at this Queens restaurant looks delicious, but we're not so sure that we'd be quite as adventurous as you once finding out what each dish was. Nevertheless, Cheburechnaya is a Queens restaurant that we will keep in mind when we're looking to dine a little further from our comfort zone. Awesome peeps! It was one of the more spacious places, especially in Queens, that we've had an R&F. I enjoyed and would bring friends, if only for the soft bread and babaganoush! Aw, I miss the R&F logo with the cute kitty! I like the new banner! Thanks. The Ramen Cat is in captivity---he ate a bit too much ramen.